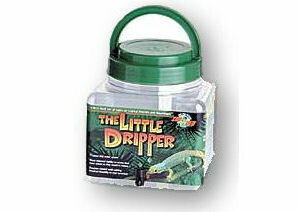 Zoo Med Little Dripper | Livefood UK Ltd. The Dripper has a folding handle lid that allows you to suspend the dripper above the enclosure. Especially helpful for those animals that need more of a tropical environment. Zoo Med Drippers are available in two sizes, the one gallon Big Dripper and the 70oz Little Dripper. Currently 9 items are on your Wish List.